81 vett. engine light will not come on with key. engine light will not come on with key. it will come on when jumped. do I have a bad E/C/M.? the carb runs rich. do you have a 5 pin ALDL under the dash.. or just the green wire to ground to make the check engine light flash..
let me see if i can find a wiring diagram..
on feed back carbs.. i use the chiltons manual #7488.. but my hard and soft cover are both boxed right now..
let me look over at autozone dot com to see what they have..
you could have a blown fuse..
do you have a DWELL METER.. either analog or digital dwell.. set it to 6 cylinder scale.. don't worry that you have an 8 cylinder.. its just the scale that the engineers used when they wrote the manuals..
less that 5 or fixed at 5 degrees of dwell there is a chart..
over 55 degrees of dwell or fixed at 55 is a different chart..
near the carb there is a green wire and a green connector to hook the dwell meter leads to.. the other dwell meter lead gets grounded..
if you connect the A and B terminal on the ALDL under the dash.. it should display really close to 30 degrees of dwell..
if you have only the green wire under the dash.. that gets grounded and the ECM power connector gets moved over to a constant power as the early units did not have keep alive memory..
i went to GM school on this in 1980/81..
81 is a 5 pin aldl..
then. check the ECM 10 amp fuse.. should have constant power.. its the ORange wire into the ecm. then check the gauges fuse.. its a 20 amp.. with a pink and black wire that also goes to the ECM.. but if you notice.. it also goes to other devices..
it goes to the pink and black wire in the connector over the passenger side carb mounting bolt.. thats the mixture control solenoid connector..
it goes to the EGR solenoid..
and the check engine light..
that pink and black wire from the gauge fuse is the turn on signal to the ECM..
if you find a blown out fuse... stop..
do not replace it.. post and i will give you some OHM meter tests..
there have been instances of the wiring insulation falling off deep in the harness. here is another image for you to print out..
and is probably attached to the bolt near or on the thermostat housing.. these have to be clean.. and tight.. and not just loose wires wrapped around the bolt..
this is an image for a camaro.. should be very very close to the corvette.. The Computer Command Control (CCC) system, installed on all 1981 cars, is basically a modified version of the C-4 system. Its main advantage over its predecessor is that it can monitor and control a larger number of interrelated emission control systems. In addition, the CCC system has a built in diagnostic system that recognizes and identifies possible operational problems and alerts the driver through a "Check Engine" light on the instrument panel. The light will remain ON until the problem is corrected. The CCC system also has built in back-up systems that, in most cases of an operational problem, will allow for the continued operation of the vehicle in a near normal manner until the repairs can be made. The CCC system has some components in common with the C-4 system, although they are not interchangeable. These components include the Electronic Control Module (ECM), which, as previously stated, controls many more functions than does its predecessor, an oxygen sensor system, an electronically controlled variable-mixture carburetor, a three-way catalytic converter, throttle position and coolant sensors, a Barometric Pressure sensor (BARO), a Manifold Absolute Pressure sensor (MAP) and a "Check Engine" light on the instrument panel. Components unique to the CCC system include the Air Injection Reaction (AIR) management system, a charcoal canister purge solenoid, EGR valve controls, a vehicle speed sensor (in the instrument panel), a Transmission Converter Clutch (TCC) solenoid (only on models with automatic transmissions), idle speed control and Electronic Spark Timing (EST). The ECM, in addition to monitoring sensors and sending out a control signal to the carburetor, also controls the following components or sub-systems: charcoal canister purge control, the AIR system, idle speed, automatic transmission converter lock-up, distributor ignition timing, the EGR valve, and the air conditioner converter clutch. The EGR valve control solenoid is activated by the ECM in a fashion similar to that of the charcoal canister purge solenoid described earlier in this section. When the engine is cold, the ECM energizes the solenoid, which blocks the vacuum signal to the EGR valve. When the engine is warm, the ECM de-energizes the solenoid and the vacuum signal is allowed to reach, then activate the EGR valve. The Transmission Converter Clutch (TCC) lock is controlled by the ECM through an electrical solenoid in the automatic transmission. When the vehicle speed sensor in the dash signals the ECM that the car has attained the pre-determined speed, the ECM energizes the solenoid which then allows the torque converter to mechanically couple the engine to the transmission. When the brake pedal is pushed, during deceleration or passing, etc., the ECM returns the transmission to fluid drive. The idle speed control adjusts the idle speed to all particular engine load conditions and will lower the idle under no-load or low-load conditions in order to conserve fuel. Not all engines use all systems. Control applications may differ. The following procedure explains how to activate the Trouble Code signal light in the instrument cluster. This is not a full fledged C-4 or CCC system troubleshooting and isolation procedure. Before suspecting the C-4 or CCC system, or any of its components, as being faulty, check the ignition system (distributor, timing, spark plugs and wires). Check the engine compression, the air cleaner and any of the emission control components that are not controlled by the ECM. Also check the intake manifold, the vacuum hoses and hose connectors for any leaks. Check the carburetor mounting bolts for tightness. As a bulb and system check, the "Check Engine" light will come on when the ignition switch is turned to the ON position, but not started. The "Check Engine" light will also show the trouble code/codes by a series of flashes, which translate as follows: when the diagnostic test lead (C-4) or terminal (CCC) under the instrument panel is grounded, with the ignition in the ON position and the engine not running, the "Check Engine" light will flash once, pause, and then flash twice in rapid succession. This is a Code 12, which indicates that the diagnostic system is working. After a long pause, the Code 12 will repeat itself two more times. This whole cycle will then repeat itself until the engine is started or the ignition switch is turned OFF. When the engine is started, the "Check Engine" light will remain on for a few seconds and then turn off. If the "Check Engine" light remains on, the self-diagnostic system has detected a problem. If the test lead (C-4) or test terminal (CCC) is then grounded, the trouble code will flash (3) three times. If more than one problem is found to be in existence, each trouble code will flash (3) three times and then change to the next one. Trouble codes will flash in numerical order (lowest code number to highest). The trouble code series will repeat themselves for as long as the test leads or terminal remains grounded. A trouble code indicates a problem with a given circuit. For example, trouble code 14 indicates a problem in the cooling sensor circuit. This includes the coolant sensor, its electrical harness and the Electronic Control Module (ECM). Since the self-diagnostic system cannot diagnose every possible fault in the system, the absence of a trouble code does not necessarily mean that the system is trouble-free. To determine whether or not a problem with the system exists that does not activate a trouble code, a system performance check must be made. This job should be left to a qualified service technician. In the case of an intermittant fault in the system, the "Check Engine" light will go out when the fault goes away, but the trouble code will remain in the memory of the ECM. Therefore, if a trouble code can be obtained even though the "Check Engine" light is not on, it must still be evaluated. It must be determined if the fault is intermittant or if the engine must be operating under certain conditions (acceleration, deceleration, etc.) before the "Check Engine" light will come on. In some cases, certain trouble codes will not be recorded in the ECM until the engine has been operated at part throttle for at least 5 to 18 minutes. On the C-4 system, the ECM erases all trouble codes every time that the ignition is turned off. In the case of intermittant faults, a long term memory is desirable. This can be produced by connecting the orange connector/lead from terminal "S" of the ECM directly to the battery (or to a `hot' fuse panel terminal). This terminal must always be disconnected immediately after diagnosis as it puts an undue strain on the battery. On the CCC system, a trouble code will be stored until the terminated `R' at the ECM has been disconnected from the battery for at least 10 seconds. On the CCC "C3" (not to be confused with the corvette model..) system, locate the test terminal under the instrument panel (see illustration). Use a jumper wire and ground only the lead. On the 78 to 1980 C-4 system, activate the trouble code by grounding the trouble code test lead. Use the illustrations to help you locate the test lead under the instrument panel (usually a white and black wire with a green connector). Run a jumper wire from the lead to a suitable ground. you will want to print this chart also..
okay I have a 5 pin aldl. all fuses are good. the ground is good, the orang wire is hot all the time at fuse box. I don't have a dwell meter, gave one away along time ago.any other way to check it? thanks for helping I appreciate it. if you jump the A and B terminals at the ALDL..
key on.. the mixture control solenoid should start clicking.. that also indicates that the computer is awake.. Item #95670 under 40 bucks.. if you look around.. like in the AAA magazine and some of the hot rod, car craft.. perhaps even in the current VETTE magazine there might be harbor freight coupons. 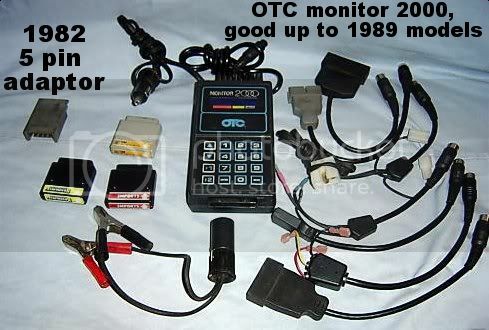 for 25 percent off one item..
some scan tools will work with these..
like this OTC monitor 2000. note the special adaptor in the upper left corner that allows the 5 pin ALDL to be hooked up to the 12 pin 83 to 94 pigtail..
check the online classified.. i have seen a monitor 2000 on the los angeles craigs for 50 bucks..
its still listed in the santa ana area..
only issue is.. it does not show in the images that rubber 5 pin adaptor.. could it be missing.. yep..
monitor 4000 and all its versions will also talk to your car..
as will early genesys systems and the snap on versions..
the monitor 2000 is only good up to the 88 or 89 model year.. but that covers millions of gm cars and trucks. drawback. one or 2 lines of data.. verses the 4 lines on the display of the otc 4000 versions..
i just looked at AZ seems the reman computers are under 90 bucks .. you will need to change the prom chip carefully from yours to the reman version..
jumped a and b terminals got solenoid clicking. does that mean the whole ECM is working or should I get the meter? if the solenoid is clicking..
and the fuses are good. the light bulb in the dash may be burned out. 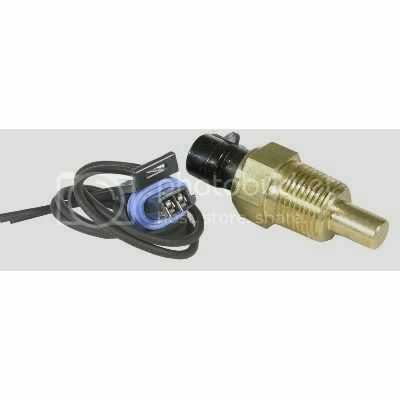 do you still have the same coaxial style of coolant temp sensor that it came with??? swap it out for a wells or duralast SU102.. other brands also have the kit for usually under twenty..
the coaxial coolant temp sensors were horrible.. when they worked they were ok.. when they failed.. they told the computer that is was -20 ... and the computer would drive the system full rich..
are you in the so cal area.. you are better off with a scan tool. for 50 bucks.. as it will display a lot more than the meter..
bad diverter valves or leaks into the air injection system will also cause crazy operation..
what happens is there is an up stream set of air injection pipes that dump air into the exhaust manifolds.. this is done during warm up and during open loop.. or when you are accelerating hard..
if you get uncommanded air into the exhaust manifolds.. you dilute the exhaust stream with this additional oxygen and drive the computer crazy..
you might also need an oxygen sensor.. THAT can only be checked with either a digital volt meter. a scan tool.. or an air fuel ratio gauge... or a digital automotive scope.. since those are not cheep.. i have the cheepest model.. it was like 400 bucks..
do not short to ground.. do not use an analog volt meter on it.. you will damage its ability to create electrons ..
hI wayne. I replced coolant sensor,plugs,wires,carb,cap,roter. bulb in dash is good, comes on when jumped... I live in Arizona. I will get a scan tool, it wood be nice to have one any way. thanks for your help,i'll let you know what happens. what codes did you get from the check engine light flashing when you jumped the ALDL?? code 12 three times is expected.. with the engine off..
----On----------on----on-----------------On----------on----on-----------------On----------on---on--------- --------do you see the pattern..
no codes, light just stayed on. than it went off.just like when you turn the key on. I grounded b on the Aldl.the light came no. 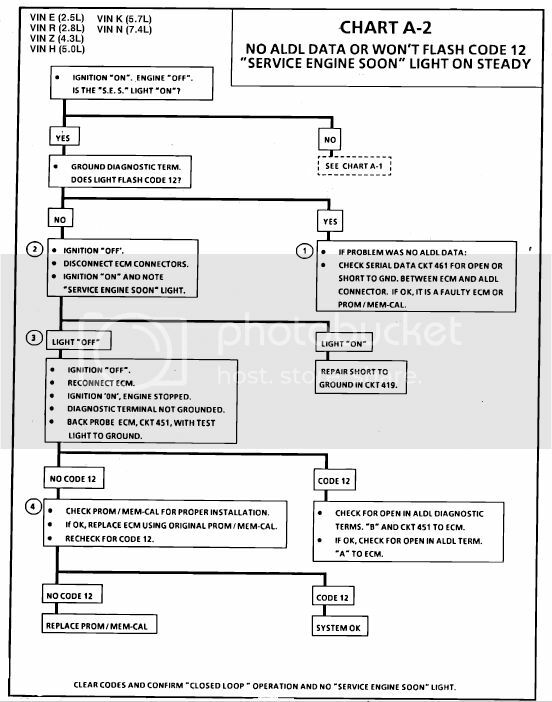 should have flashed code 12.. i don't have a copy of chart A1 handy.. its the other side of the won't flash code 12 chart..
were you able to print the various images above.. i leave them in the jpg format so they can be clicked on and printed usually..
got any images under the hood to see how stuff is hooked up???  use photobucket .. its free.. paste the links here..